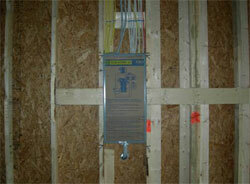 Why is the Placement of an Electrical Panel in New Home Construction Critical? The second day of electrical installation continues with the placement of the Electrical Breaker panel in the garage. This particular unit from Square D fits neatly between the studs and flush mounts in the garage wall. All of the wiring, be it 110v or 220v will terminate here, and the meter for your home will reside on the opposite side of the box on the exterior of the house. The safety of your home should always be among your primary concern. This is why it is very important for you to make sure that every safety detail is attended to from the construction phase to the upkeep and maintenance. In this regard, one of the ways you can make sure that your house will be safe from fires or other accidents related to electricity as well as electrical faults is by properly installing the electrical panel. The electrical panel is necessary for any home because it functions like a nerve center when it comes to electricity. This is essentially because it is the electrical panel that distributes the electricity to all the electrical circuits that are installed in your home. Compared to the human body, the electrical panel is considered the central nervous system. It is where all factors related to electricity are controlled. It is where you will turn on or off the many circuits that are installed all over your home. Everything from light bulbs, appliances and other gadgets powered by electricity will be connected and controlled here. Having an electrical panel keeps the electrical aspect of your home organized. This way, you can control everything simply and with less hassle as well as complications. This is especially useful in times of emergencies. In case there is an accident or something urgent wherein you will need to turn off all the electrical devices or gadgets in your home, you will simply have to turn them off using the main breaker in the control panel. Thus, not only is it more convenient, it is also faster, paving way for a quick response which is necessary during emergencies. Second, if you have to repair something electrical in your home, the electrical current that is connected to the particular circuit involved in the repair should be turned off so you can go on with the repair safely. It is not only necessary to stress the importance of having an electrical panel in your home, but also properly maintaining it so it can be safe and user-friendly at all times. Actually, this can be accomplished in many ways. For one, it is actually important to have a regular check up when it comes to the safety of the electrical panel in your home. This is to prevent faulty electrical wirings and systems, which may cause fire hazards and other accidents. More than regular check-ups and proper maintenance, ample knowledge on electrical panel safety and electrical safety in general is also very much vital to ensure that your home will be safe on a daily basis from accidents that can be caused by faulty electrical wirings and carelessness. Updating or installing a new panel definitely makes the electrical panel safer and more effective. It is an excellent and sometimes necessary decision. This will improve the convenience as well as the safety of your home. Always remember that just because you have a new or updated electrical panel in your home, you still have to make it a point to properly maintain it and make sure it is at tip-top shape at all times to ensure the safety of your home and the people living in it.